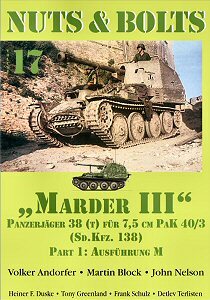 Following on from volume 15 on the Sd.Kfz.139 Marder III 7.62cm comes this volume from the same authors and deals exclusively with the Marder III Ausf. M.
The book is what we have come to expect from Nuts & Bolts being packed full of detailed information and photographs, the first 33 pages is almost exclusively text in both German and English and gives a detailed technical description of the Ausf. M with charts showing the production numbers and unit allocation details. There is markings guide plus comprehensive combat history and organization of SP anti-tanks units with detailed histories for Panzerjäger-Abteilung 38 (2. Pz.Div), Panzerjäger-Abteilung 10 (10. Pz.Div/Inf.Div.(mot.)/Pz.Gren.Div. ), Panzerjäger-Abteilung 171 (17. Pz.Div), Pz.Jg.Abt. LSSAH/SS Pz.Jg.Abt.1 and Panzerjäger-Abteilung 744 (Heerestruppe). The next 25 pages contain many wartime in-action photos of the Ausf. M in the Russian, Italian and NE Europe theatres with a few interesting shots of a vehicle captured by the British in Italy then used by them. The photos show a good variety of markings and storage layouts with many diorama possibilities with the picture captions again in German and English text. The centre of the book has three pages of colour profile drawings and a set of 1/35th plans for the early version Ausf. M.
The final 70 pages are devoted to detailed close-up pictures of surviving museum vehicles with full walkarounds of the exterior showing the early and later models with different driver’s cover and exhaust arrangements and drive sprockets plus just about every other detail you may want. The interior of the fighting compartment is shown in equally good detail with many shots of the walls, floor and forward gun shield plus the gun breech and mountings as well as photos of the lower hull area showing the gearbox, driver’s compartment details and forward final drive and steering mechanisms to make even the most avid detail freak salivate. There is a brief modelling section covering mostly the new Tamiya kit with a mention of the 1/72, 76 kits available. Overall this is superb book on the Marder III Ausf. M and provides just about all the information you would ever want on the vehicle.